The horror stories embedded in our culture have mostly grown out of ancient folk wisdom. They’re used to warn us against taboo behaviour and to scare the young away from danger. Don’t go into the woods alone, they say, for scary creatures with sharp teeth live there. Vampire fiction has always been a precaution about the seductive side of evil and the corrupting influence of power. Vampyr is a fresh story in this vein but one that is held back by a tendency to reach beyond its grasp. You are Doctor Jonathan Reid, a brilliant surgeon and transfusion researcher who has just returned home after serving as a medical officer on the frontlines in the First World War. Reid, along with many of Vampyr’s large cast of characters, is deeply affected by the war, but his concerns are secondary to the devastating outbreak of Spanish Flu that is ravaging the poorer districts of London in 1918. Corpses pile up faster than they can be buried; the medical community is helpless against the rotting tide. As the game opens, Reid returns from an unexpected bout of unconsciousness to find himself in a mass grave, surrounded by the dead. He hallucinates the world as crumbling ash while voices echo in his head, barely understood. All Reid knows for sure is that he is very, very thirsty. The opening few minutes do an excellent job of setting the stage for the story to come. Reid winds up working at the Pembroke Hospital in the East End after being rescued by fellow physician, Edgar Swansea, who knows that the flu epidemic is hiding an outbreak of vampirism. As a member of the Brotherhood of Saint Paul’s Stole, Swansea wants to learn what or who is responsible for the surge in undead activity. Vampyr sets out to do a lot for one game: it’s a third-person action adventure with lock-on combat that has you managing a stamina meter, which you mostly use up to avoid attacks. It’s also a narrative adventure that urges you to explore a sprawling and labyrinthine map of London’s East End in search of citizens to interview and problems to resolve. There’s even a management layer introduced as Reid keeps tabs on the health of the citizens and concocts medicines to help the ill.
There’s a lot of fighting to be done as you make your way through London’s seedy dockyards and neighbourhoods. Swansea isn’t the only one who’s cottoned on to the recent undead outbreak – there’s a gang of militant vampire hunters called Priwen’s Guard who prowl the streets looking for “leeches,” armed with clubs, shotguns, and crucifixes. And then there’s the skal: the discarded offspring of careless vampires who have become ravenous and feral in their thirst. With these threats around it’s a big shame that the combat underwhelms. It’s functional and can be challenging, sure, but it cannot escape comparison to Bloodborne, to which it pales dramatically. There aren’t enough enemy types and most don’t push you to change up your tactics. Boss fights in particular are disappointing as they typically involve circling your foe, dodging a string of attacks, and then dashing in for a few quick strikes. Rinse, lather, repeat. The upgradeable weapons fare a little better, as they include two-handed polearms, axes, surgical hacksaws, and firearms. But they don’t have the character of Bloodborne’s trick weapons. 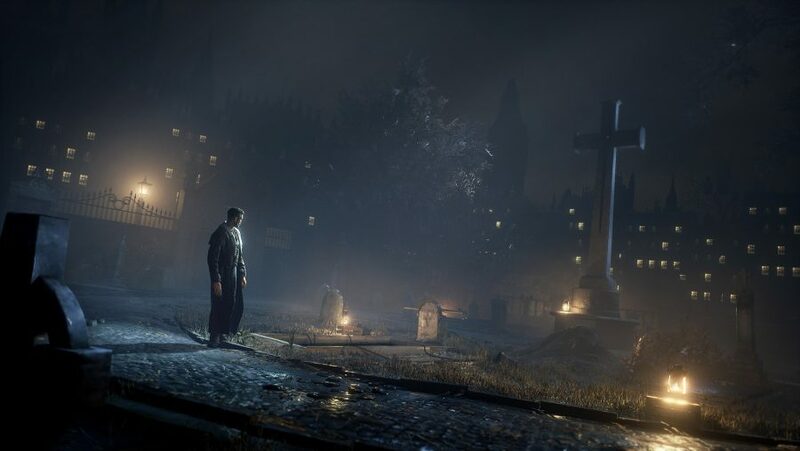 The one area Vampyr does hold up against its superior is Reid’s vampiric blink ability, which he uses to dart out of danger, with most of the grace of Bloodborne’s birdlike dash. It’s one of Reid’s vampire abilities – which you can expand upon and improve by cashing in experience in a hideout – each of which are powered by the blood you drain from stunned enemies, or the vials you craft at workbenches. 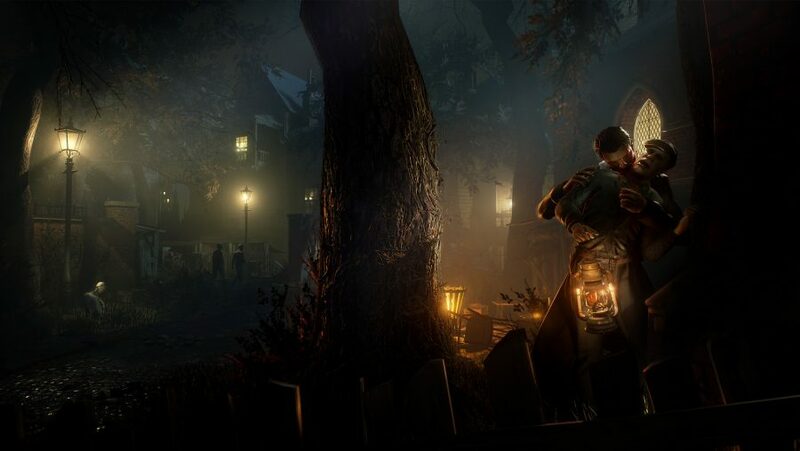 Vampyr treads on firmer ground with its story, which is filled with strange, suspicious, and sympathetic people who are caught up in the carnage on the streets. Between the flu, the war, and debilitating poverty, the East End’s citizens are largely oblivious to the vampire activity in their midst. 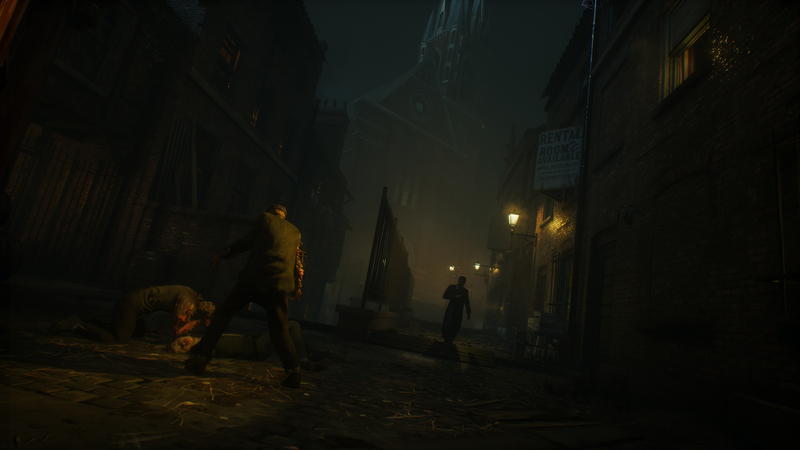 There are tons of side stories about broken dreams, tragedy, and love scattered around Vampyr’s maze-like streets. All are fully voiced, with some terrific performances turned in for key characters, particularly Reid. The worst of them step in time with the stereotypes you’d expect, cursing at you in cockney accents that belong in a staging of Sweeney Todd. The character models are dated too, but the attention given to the textures and details of costumes and the environments go a long way to make up for this. Surprisingly, it’s the management layer that puts Vampyr in better stead against its peers in the genre. Each of the four districts has its own chart of citizens who are all grouped around that particular community’s pillar. If too many citizens in a district fall ill then it’ll descend into chaos, which means tougher enemies will emerge on the streets. 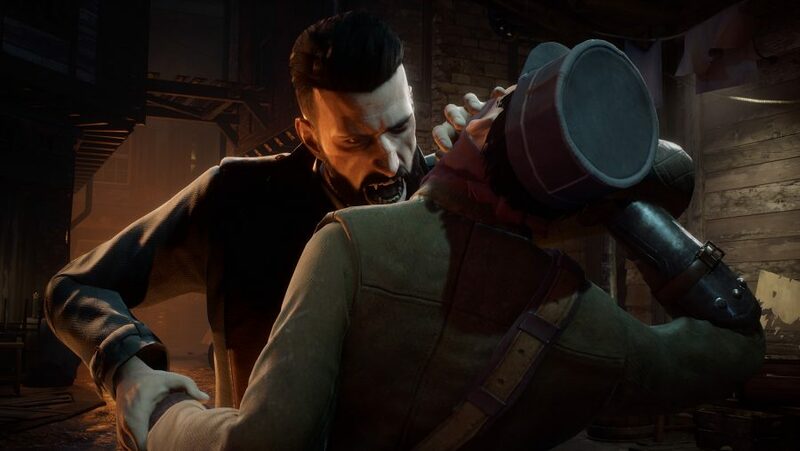 It’s important to work against this as Vampyr doesn’t have fast-travel, and so the treks from one side of Whitechapel to the other can become a slog if the path is crawling with werewolves. You won’t necessarily miss fast-travel, though, as there’s value in prowling the streets of London, fangs at the ready. Most of Vampyr’s cast of characters can be fed upon for tasty bursts of XP. You simply need to engage them in conversation, use your mesmerise ability, and lead the hypnotised quarry to a quiet spot where you can sink your teeth into their neck, draining them of their blood. However, some characters are more resistant to your mesmerism, so you’ll need to be a high enough level to overpower their will. It’s an ingenious device, simultaneously a compelling game system – it’s far and away the most effective method for levelling your abilities – and one that ties neatly into the classic image of the seductive creature of the night. The upshot of this system is that you actually begin to think like a vampire. Your interest in healing the sick may begin with a noble urge to keep a district from falling into ruin, but eventually you’ll run into a boss who gives you a drubbing, and suddenly the neighbourhoods appear as if a farm full of animals to fatten up. I was about to make another trip to an early boss encounter but found myself thinking, ‘I should go bite someone. That would make this easier.’ And it did. What’s struck me most about my time with Vampyr is that it manages to turn you into a predator through its mechanics as much as it does with its storytelling. It does collapse under its own weight by the end, but the fact that it so effectively seduces you, almost trance-like, into roleplaying a villain makes it worth biting into. Packed with fresh ideas, Vampyr is a worthy attempt at something different, even if it doesn't always deliver on its ambitions.